. 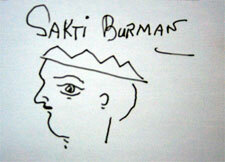 :: Sakti Burman - Abode of Creativity ::. SAKTI BURMAN: Sakti Burman's paintings evoke the look of a weathered fresco, depicting figures in hues that the viewer feels were once vivid, but that are now faded. It transports one into a dream-like world, where the perspective and composition is often that of medieval icons. Burman uses a marbling effect, achieved by blending oils with acrylics, and employs pointillism to apply paint. On Burman's canvas, one sees mythical creatures - they tell ancient tales of courtly romances. They bring alive an enchanting world - of comely maidens, children astride elephants, flutists, fruit laden trees, exotic flowers, birds and beasts - a lost paradise, where all creatures dwell in harmony. Each work is captivating for its sheer delicacy. Working in his Paris atelier, alone, Sakti Burman is in communion with this private universe of enchanting creatures. Engaging lines of grace and beauty, he creates a sense of tranquility in his art. Frozen in time, is an ageless world of elegance and splendor. 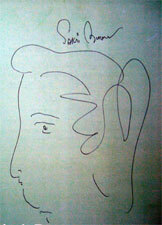 Born in Calcutta, in 1936, Burman graduated from the Calcutta College of Art and Crafts in 1956. He studied at L'Ecole Nationale Superieure des Beaux Arts in Paris, visiting Italy frequently and becoming inspired by the frescoes and paintings of the Renaissance period. Over the years, he has had exhibitions in London, Iran, Moscow, Leningrad, Belfast and Yokohama. Sakti Burman continues to live and work in Paris.